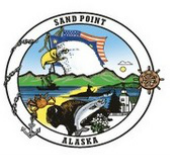 Welcome to the official City of Sand Point web site! Sand Point, also known as Qagun Tayagungin, is a city in the eastern portion of the Aleutian Chain. The 2000 census population was 952, and by 2010 the number of residents had risen to 976. The population always swells in the summer as salmon fishing hits full stride. Sand Point is home to the largest fleet of commercial fishing vessels in the Aleutian region. Sand Point is located on northwestern Popof Island, off the Alaska Peninsula. It is in the Aleutians East Borough of Alaska, near the entrance to the Bering Sea. Almost half the inhabitants are of Aleut descent, mainly from the Qagan Tayagungin Tribe, and support themselves by fishing and fish processing. There is a cold storage, fish meal, and fish-processing plant owned and operated by Trident Seafoods and Peter Pan Seafoods has a support facility in the community. Sand Point has an airport with a 5,200 feet paved runway and daily flights (weather permitting) to Anchorage, 575 nautical miles to the northeast. Interested in reading the City Administrator's monthly reports to the City Council? Just click here!